Sagar (Madhya Pradesh) [India], Mar 23 (ANI): Gopal Bhargava">Abhishek Gopal Bhargava, son of senior BJP leader and leader of opposition in Madhya Pradesh Assembly, Gopal Bhargava, has withdrawn from contesting the ensuing Lok Sabha polls claiming he does not want to promote 'dynasty' politics. The junior Bhargava claimed that his name was sent to the election committee by the party for considering his candidature from three Lok Sabha constituencies - Sagar, Damoh and Khajuraho but he said he doesn't want to do politics with "blot of dynasty" politics over him. The decision came after Bharatiya Janata Party (BJP) on Friday released a list of 36 candidates for Lok Sabha candidates in Andhra Pradesh, Assam, Maharashtra and Odisha ahead of the general elections. "I am feeling guilty after Prime Minister Narendra Modi and L K Advani gave statements against the dynasty politics. 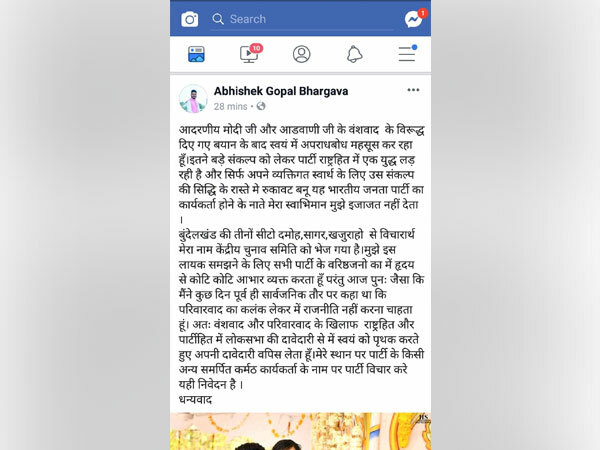 When the party is fighting for such a big cause then my conscious doesn’t allow me to become a roadblock," Gopal Bhargava">Abhishek Gopal Bhargava wrote on his Facebook post. "I don’t want to do politics taking the blot of dynasty politics. Hence, in the national interest and against the dynasty and family politics I have decided to withdraw my claim from the Lok Sabha. The party must consider somebody else who is deserving," he wrote.